The eagerly awaited third issue of the FIRE Project SAR eMagazine “SAR Spotlight” has just been published by the volunteers in the Nighthawk FIRE Project team. Issues One & Two of “SAR Spotlight” proved phenomenally popular and the FIRE Project download server was under very heavy load during the four weeks following publication in December 2012. Additional download resource has been made available but if the server slows down or asks readers to try again later, please persevere and try again. The eMagazine is well worth the effort. The new production system has been introduced and should help download demand by creating the eMag in only 3.13 MB, without loss of quality, and including lavish illustration in full colour. 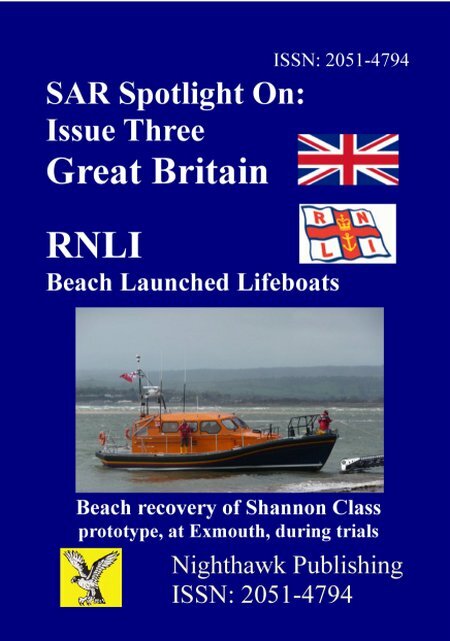 Issue Three tells the story of the new RNLI Shannon Class all-weather lifeboats that begin introduction during Summer 2013. This exciting new craft is the first RNLI ALB beach-launch capable boat to exceed 25 knots, a 50% increase in speed over the ALBs it will be replacing. The first four new Shannon ALBs have been allocated to RNLI Lifeboat Stations and are being completed at a commercial boat yard to the RNLI design and specification and from hulls moulded by an RNLI facility. A further six boats have been allocated and are expected to be completed at a temporary RNLI facility, while the new RNLI lifeboat factory and maintenance center is built a the Poole Headquarters complex. More than 50 Shannon Class boats are expected to be built for RNLI Lifeboat stations and interest has been expressed by lifeboat services in other countries which have already purchased earlier RNLI-designed lifeboats. The Shannon class uses water jet propulsion, allowing it to operate in very shallow water, and it has been designed to launch across open beaches on its specially designed tracked launch and recovery system. It will also be issued to some RNLI Lifeboat Stations where the ALB will lie afloat, and it will be issued to some of the RNLI stations that launch directly from the boathouse down a steep slipway. This is therefore a very versatile ALB, a significant increase in life saving capability, and one which has new levels of safety and comfort for crew and survivors. It is self-righting with up to 25 crew and survivors, but has the ability to take a total of 48 crew and survivors at the expense of self-righting capability. Issue Three also tells the story of the very successful Mersey Class that will be replaced by the Shannon Class and the stories of three beach launching RNLI Lifeboat Stations.